3 & 8.81 grams per tonne (g/t) gold in grab samples from the east and northeast regions (News Release of July 26, 2018). Historic (1913 & 1937) chip and channel samples in northeast region reported to include 4.11 g/t gold over 0.9 meters and 9.6 g/t gold over 0.18 meters. Historic (2011) rock dump grab samples near an adit in north-central region reported to return 6.5, 7.4 and 11.9% zinc. Multiple types of mineralization including polymetallic veins, gold bearing quartz veins and porphyry / porphyry-related. Occurrences with silver, gold, lead, zinc, copper and / or molybdenum are reported in various regions of the Treasure Mountain Silver Property. 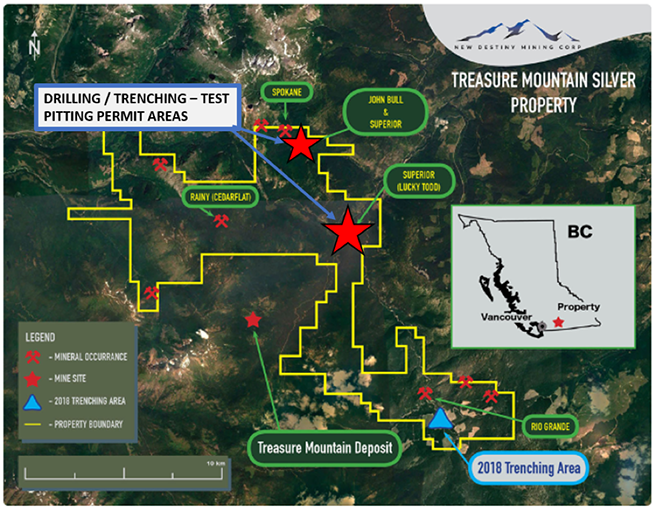 The multi-year work permit covers two target areas within the Treasure Mountain Silver Property. One target area is within the northeast region of the property in an area of reported gold bearing quartz veins. A quartz grab sample collected by the Company during 2018 in this area returned 11.3 g/t gold. The second target area is within the east region of the property in the area of the Superior (Lucky Todd) copper-gold occurrence. A porphyry dyke grab sample collected by the Company during 2018 at this occurrence returned 8.81 g/t gold. Another 2018 sample in this target area returned 0.894 % copper and 45 g/t silver. The permit is for both mechanical trenching / test pitting (up to 10 sites) and for diamond drilling (up to 11 sites). The permit was received by the Company’s option partner, Ximen Mining Corp., the mineral tenure rights holder.